Following is a list of report/documents that have been prepared regarding the Cowan Point project to date. DRAFT Cowan Point/Josephine Lake Development, Review of Water Supply, prepared by Kerr Wood Leidal Associates Ltd., dated December 2007. The draft report incorporated the as-constructed dam and the new spillway crest elevation, and concluded that the sustainable yield of Josephine Lake would support a population capacity of 360 lots (average 2.6 people per lot), or 937 people. Technical Memorandum re: Water Consumption at Cowan Point: Comparison with Current Assumptions, prepared by Kerr Wood Leidal Associates Ltd., dated June 16, 2006. Cowan Point/Josephine Lake Development, Review of Water Supply, prepared by Kerr Wood Leidal Associates Ltd., dated April 2005. An update of the 1999 report, and anticipated construction of a dam to raise the lake. Cowan Point/Josephine Lake Development, Review of Water Supply, prepared by Kerr Wood Leidal Associates Ltd., dated March 2003. An update of the 1999 report. Cowan Point/Josephine Lake Development, Review of Water Supply and Liquid Waste Management, prepared by Kerr Wood Leidal Associates Ltd., dated March 2003. An update of the 1999 report. Cowan Point/Josephine Lake Development, Review of Water Supply and Liquid Waste Management, prepared by Kerr Wood Leidal Associates Ltd., dated October 2002. An update of the 1999 report. Cowan Point Lands Water Supply and Liquid Waste Management, prepared by Kerr Wood Leidal Associates Ltd., dated August 1999, completed for the Islands Trust. Cowan Point Area, Bowen Island — Hydrology Study of Creek Systems and Natural Storage Areas to Determine Water Supply Capability, prepared by Kerr Wood Leidal Associates Ltd., dated 1977. 2 volumes. Cowan Point Hydrology Study, Bowen Island, prepared by Stanley Associates, dated 1991. Cowan Point Utility Company Ltd — Design Brief — New Water Treatment Plant, prepared by Kerr Wood Leidal Associates Ltd., dated July 26, 2006. Cowan Point Estates Preliminary Assessment of Water Treatment and Conservation Options, prepared by NovaTec Consultants Inc., dated December 2003. Cowan Point Project — Groundwater Site Assessment, prepared by Quinn & Associates Environmental Ltd., dated September 9, 2005. Preliminary Evaluation of the Groundwater Regime in the Area of a Proposed Residential/Recreational Development at Cowan Point on Bowen Island, prepared by Pacific Hydrology Consultants Ltd. for L.G.L. Environmental Research Associates Ltd., dated July 10, 1991. Registration under Municipal Wastewater Regulation (formerly Municipal Sewage Regulation), initially issued to Bowen Island Properties Ltd in June 2004, and amended in the name of Cowan Point Sewage Treatment Inc in July 2009. For Phase 1, permits discharge of 196 cubic metres per day of secondary effluent to marine waters of Queen Charlotte Channel. For Phase 2, permits discharge of 391 cubic metres per day into marine waters during the winter, and 239 cubic metres per day of reclaimed water for irrigation of the onsite golf course during the summer. Section 3, Cowan Point Community Sewer System Description, prepared by ECOfluid Systems Inc, included in Assurance Plan Revision 1A, dated March 2009. Includes design description of wastewater treatment plant. Environmental Impact Assessment, Sewer & Stormwater Marine Outfall, Seymour Bay Landing Project, Bowen Island, prepared by Whitehead Environmental Consultants Ltd., dated November 26, 2004. Marine Outfall Evaluation, Cowan Point Estates Development, Bowen Island, prepared by Komex International Ltd., dated December 2004. Wastewater Treatment and Disposal Options Assessment for Cowan Point Estates Community Development, prepared by NovaTec Consultants Inc., dated October 2002. Drainage Catchment Plan, Detailed Areas Schematic (Drawing Number 2877-5, DCP 7, Rev 7), prepared by Webster Engineering Ltd., dated October 12, 2011. Letter to Bowen Island Municipality with drawing by Webster Engineering Ltd. regarding stormwater ponds to be constructed with Section 9 Approval from the Ministry of Environment, dated March 22, 2006. Appendix 4 to Remediation Plan, Phase 2, prepared by Webster Engineering Ltd., dated April 27, 2005. Engineering drawing of stormwater detention and flow diversion works above the golf course irrigation reservoir. Letter from Webster Engineering Ltd dated September 1, 2004 in response to issues raised by Land and Water British Columbia as they pertain to the stormwater management plan. Stormwater Management Plan, prepared by Webster Engineering Ltd for the Cowan Point development, dated June 14, 2004. Cowan Point/Josephine Lake Development, Review of Stormwater Management, prepared by Kerr Wood Leidal Associates Ltd., dated March 2003. An update of the August 1999 report. Cowan Point/Josephine Lake Development, Review of Water Supply and Stormwater Management, prepared by Kerr Wood Leidal Associates Ltd., dated February 2003. An update of the August 1999 report. Cowan Point Lands Water Supply and Liquid Waste Management, prepared by Kerr Wood Leidal Associates Ltd., dated August 1999, completed for the Islands Trust. Includes a section about stormwater management. Environmental Impact Assessment: Seymour Bay Landing Project, Bowen Island, prepared by Whitehead Environmental Consultants Ltd., NovaTec Consultants Inc., Komex International Ltd., and Webster Engineering Ltd., dated February 2004. Appendix 1: Species and Ecosystems at Risk prepared by Whitehead Environmental Consultants Ltd., dated September 15, 2004. To be appended to the Environmental Impact Assessment referred to in 4.a above. Seymour Bay Landing Project: Preliminary Survey for Rare Plants and Plant Communities, prepared by Ksenia Barton, September 7, 2004. Hydrogeological Assessment, prepared by Quinn Environmental Associates Ltd., dated September 1, 2004. Riparian Revegetation for Lee Creek at Utility Bridge, prepared by Whitehead Environmental Consultants Ltd., dated April 29, 2004, with copy of purchase order by Bowen Island Properties Ltd for transplanting stock for riparian revegetation at Lee Creek utility bridge site. Long Term Infiltration Capacity of Roadside Drainage Ditches, prepared by Quinn Environmental Associates Ltd., dated November 22, 2004. Proposed Josephine Creek to Lee Creek Flow Diversion, prepared by Quinn Environmental Associates Ltd., dated November 10, 2004. Provided an evaluation of the feasibility of enhancing flow in Lee Creek by diverting water from Josephine Creek. Cowan Point Project — Design Specifications for Constructed Wetlands, prepared by Whitehead Environmental Consultants Ltd., dated November 16, 2004. Engineering drawing by Webster Engineering Ltd of stormwater detention and flow diversion works above the golf course irrigation reservoir, dated December 20, 2004. Lee Creek Utility Bridge, prepared by Pottinger Gaherty Environmental Consultants Ltd., dated April 19, 2005. An assessment of the installation of a utility bridge over Lee Creek. Habitat Compensation Plan 5, Bowen Island 9-Hole Public Golf Course, Seymour Landing Project, prepared by Whitehead Environmental Consultants Ltd., dated April 27, 2005. Engineering drawing by Webster Engineering Ltd for stormwater detention and groundwater recharge works, dated March 14, 2005. Inspection of Phase 1 Remediation, Seymour Bay Landing Project, prepared by Whitehead Environmental Consultants Ltd., dated November 12, 2004. West Napoleon Creek, prepared by Pottinger Gaherty Environmental Consultants Ltd., dated April 26, 2005. An assessment of riparian setback needs from drainage routes 1, 2, 3, and 4 (west Napoleon Creek drainage system). Recommended elements of a statutory right-of-way for stormwater management in favour of the Bowen Island Municipality. Phase 1 Environmental Assessment of the Cowan Point Lands, Bowen Island, B.C., prepared by Whitehead Environmental Consultants Ltd. for HSBC Bank Canada, dated January 15, 2003. Biophysical Assessment of D.L. 2448, Seymour Bay, Bowen Island, prepared by Whitehead Environmental Consultants Ltd., dated October 31, 2002. Biophysical Assessment and Preliminary Planning Concepts for the Cowan Point Lands, Bowen Island, B.C., prepared by Dunster & Associates Environmental Consultants Ltd., dated January 1999. 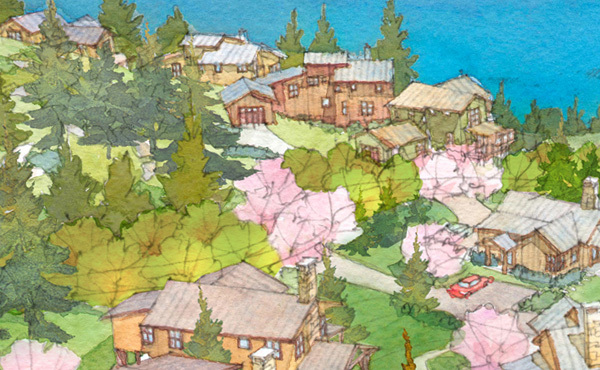 Cowan Point Lands: Comprehensive Development Plan, Bowen Island, B.C., prepared by Catherine Berris Associates Inc. and Planistics Management Inc., dated December 1999. Archaeological Impact Assessment of Proposed Neighbourhood Development, Bowen Island, B.C. : Heritage Inspection Permit 2004-250, prepared by Golder Associates Ltd., dated September 9, 2004. Marine Survey of Seymour Bay, Bowen Island, B.C., prepared by LGL Limited Environmental Research Associates for Praxis Group Ltd., dated April 30, 1991.